Concord grapes are grown mainly on the East Coast, but they can and do grow in other cool climates. The Concord grape is a beautiful, blue-black grape that often appears to have been dusted with powdered silver. This mild-flavored grape has seeds and a slip-off skin. It’s available August to October and is used mainly for juice, jelly and out-of-hand eating. 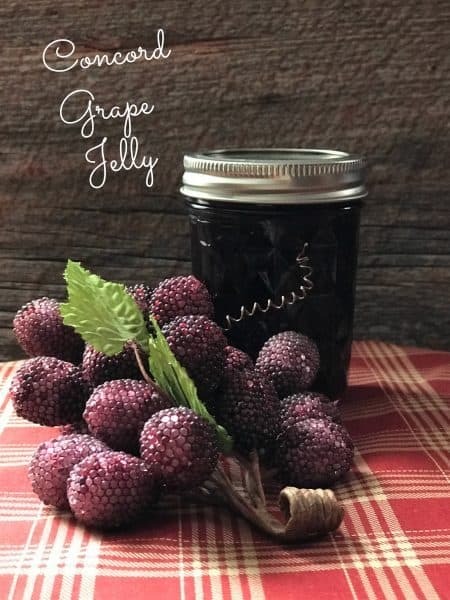 This edible berry grows on clusters on small scrubs or climbing vines in temperate zones throughout the world including; Africa, Asia, Australia, Europe and North and South America. California is the largest U.S. producer of grapes, both for wine and for the table. There are thousands of grape varieties, each with its own particular use and charm. Grapes are smooth-skinned and juicy; they may or may not contain seeds. Grapes are divided are into color categories of white or black (also referred to as “red”). White grape varieties range in color from pale-yellow green to light green, and black grapes from light red to purple-black. 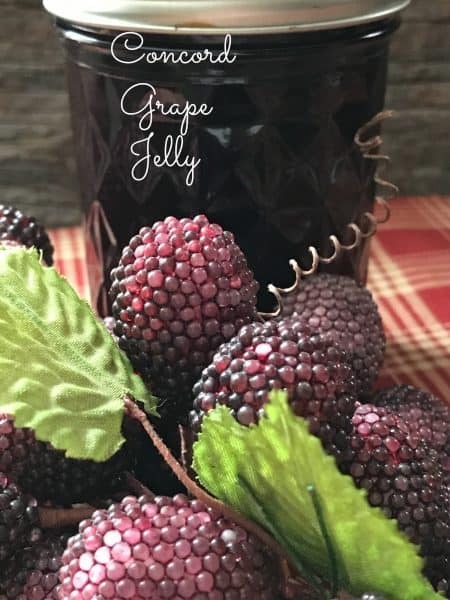 Grapes are also classified by the way they’re used, as in wine, table or commercial food production, such as Muscat grapes for raisins, Zante grapes for currants and Concord grapes for juice, jams and jellies. 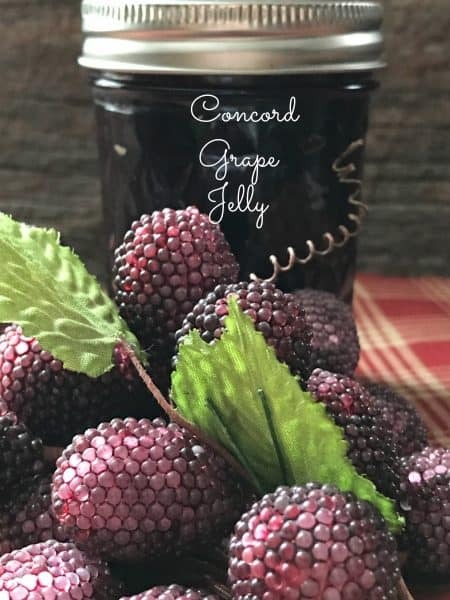 It’s a good indication that your hubby knows you well when he brings home a bushel basket full of just picked, fresh Concord grapes (from his friends house), instead of a box of chocolates or a dozen of roses and you say, “Wow Honey, Thank-you! You shouldn’t have! !” And you proceed to clean and wash your grapes, grinning from ear to ear! Now that’s true love. 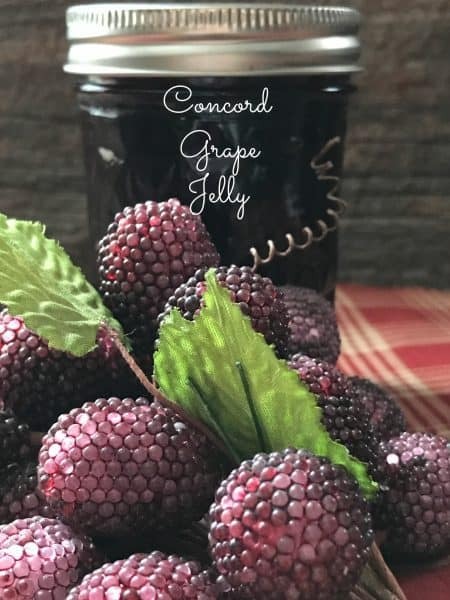 A delicious and tasty jelly with a wonderful grape flavor from fresh picked Concord Grapes. Put grape juice in a large saucepan. Add sugar, stirring until dissolved. Bring to a boil over high heat, stirring constantly. Stir in liquid pectin. Return to a full rolling boil. Boil hard for 1 minute, stirring constantly. Remove from heat. Skim foam if necessary. Ladle hot jelly into hot jars, leaving 1/4-inch headspace. Adjust two-piece caps. Process for 10 minutes in a boiling-water canner. 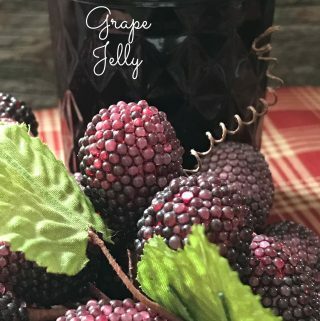 How to Make Juice for Jelly from soft fruits such as Grapes. Select top quality fresh picked fruit, if available. Wash and stem fruit. Place grapes in a large saucepan. Slightly crush fruit using a potato masher, add a pinch of salt. Add a pinch of salt and 1/4 cup water for each quart prepared is an optional step. I prefer not to add any water. Cover; simmer until fruit is soft. Strain mixture through a damp jelly bag or several layers of cheesecloth to extract juice. Juice may be used fresh, canned or frozen for later use. Grape Jelly Meatballs made even better with homemade grape jelly.